Roush has just shown off pictures off their 2015 Roush Mustang and it looks amazing! Just a few days ago Saleen debuted the 2015 S302 Mustang to mixed, but mostly positive reviews. Roush has answered back with their S550 specialty Mustang which looks aggressive yet refined, giving it an incredible appearance. Per usual, Roush is giving the new Mustang the full treatment, from a performance and styling perspective. Unlike Saleen, Roush is offering Mustang enthusiasts Roush packages for the EcoBoost, V6, and GT. There is not a sole focus on the GT, offering the opportunity for EcoBoost and V6 owners alike to own a Roush Mustang. Regardless of engine displacement, Roush Mustang owners will be offered varied levels of performance and power. All 2015 Roush Mustangs will benefit from the improved appearance of Roush factory body kits, enhancing the lines and profile of the 2015 Mustang. A lot of complaints about the 2015 Mustang’s styling focused on the rounded look of the rear and front fascia, giving it a soft look. Roush remedied this by by replacing the front fascia and grille with their own styling parts, giving it a more defined and aggressive appearance, which in-turn actually extended the nose of the Mustang by a few inches. Returning to the 2015 Roush are the common place styling cues such as hood vents, front and rear splitters, a signature Roush spoiler, and more. According to Roush, this is not just superfluous styling for the sake of styling, but rather styling that serves a purpose. Roush claims that these modifications help to improve the aerodynamics of the 2015 Mustang, which consequently improves the overall performance of the S550 Mustang. Melding together style and performance are the Roush Mustang Wheels featured on the 2015 Mustang. Not only do the new Roush wheels incorporate classic Roush styling, but the 20″ cast wheels offer lighter than stock weight while being able to fit larger rubber to get better grip. Roush Mustangs that come equipped from the factory with the performance package brakes will also see improved rotors and pads offering increased braking power. Rounding out the handling portion of Roush vehicles are the choice of two different types of adjustable coil-over struts. Roush is offering it’s different staged kits, RS1, RS2, and RS3 for the 2015 Mustang with each one offering varied levels of tuning. While it is still early on and details are murky, we do know that the RS1 will focus on EcoBoost tuning, RS2 will offer improved V8 performance and the RS3 will offer a supercharged option with power output expected around the 675+ HP range. Roush Mustangs will benefit from upgraded exhausts and other performance goodies that will take a stock Mustang to the next level. How much will a 2015 Roush Mustang Cost? Details have not been released as of yet, but we can expect options starting in the $40,000 range and increasing with each stage. 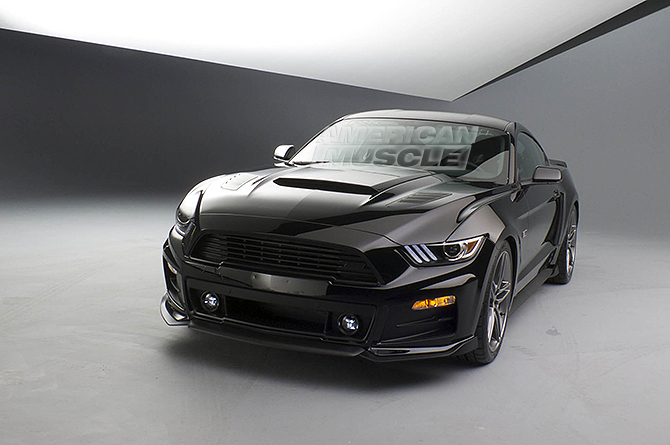 The 2015 Roush Mustang is expected to be debuted in person at the 2014 SEMA Show in Vegas. If buying a whole Roush tuned Mustang is not a viable option, Mustang owners can benefit from Roush parts being available in the 2015 Mustang parts market. Whether it be styling, wheels, brakes, or a supercharger, all 2015 Mustang owners can reap the benefits of Roush quality and performance. What are your thoughts on the 2015 Roush Mustang? Do you like the Saleen S302 or the Roush RS3 more? Comment below with your thoughts! Next Entry Hot Lap: Project Fox Body, 2015 Mustang News and Giveaways, New Products and More! Front-end renders of the Saleen S302 look a bit too Camaro-ish, IMHO. I think this example of a 2015 Roush mixes enough of the prior-gen Roushes that those riding the fence on the new design might be encouraged to accept it. Roush hit a home run over the Saleen mustangs are meant to be tough looking and need the aggressive look that Roush pulled off. Whoa….didn’t think about trading in my 2013, but the force is STRONG with this one! I do like the block-lettering on the back, just needs to be my name. Never understood the cult of personally. Front Bumper, trunk lip & quad-tip exhaust are handsome. He cleverly made the license plate area wide enough for European number plates. The only down side to the new 5.0’s is hp & tq. On 91 octane it’s only 425hp/395tq… So if you are lucky enough to live in a state that still carries 93 octane, that’s the certified 435hp/400tq rating. I’ll take the new front, rear, muffs and some light 18 or 19″ wheels (taller wheels add weight and lengthen 1 full revolution by 1″, thereby making the car slower) . in a test of the exact same car, on 18″ wheels it did 0-60 in 6 sec, but on 16″ wheels, that time got faster and dropped to 5.1 sec. At 60 mph that’s a 2 car length gap. Oh, and when they slapped 19″ on, the 0-60 went to 6.4 sec. Slower indeed. Big tall wheels maybe kool but hurt overall acceleration, lengthen braking distances, hurt andlingh and lower mpg’s. Stay 19″ and under for a good fast cruiser, 18 and undergo be very fast and 17″ or less fr tack beasts. Seriously. Time to get with the times and drop all this fake stuff and really start minimizing the drag when and where all this fake stuff is being placed. Or actually make the damn thing functional so the premium prices we pay for these tuned cars actually comes with a performance return on every single treatment that we invest in. As a special teams tuner vehicle this supposed to be REAL and FUNCTIONAL to the core and outward to every damn scoop placed on it. This is an investment for the intended buyer and if it is to be one that is truly taken seriously by the onlookers then every internal to every visual addition needs to add positively to the performance. Otherwise you’re just perpetuating the joke that’s been around since the Faux ornamental market started. Otherwise if this is any indication of the rest of what is done…. then I suspect there will be more crap added that also doesn’t do what its supposed to. At which point your investment just became an expense. I didn’t see any side scoops on the SALEEN….so perhaps they are thinking pure performance only. Try again Jack. Then you’ll have my attention and perhaps my money, too. LoLZ! Show me the carfax… Sighs.. fake scopes again. Very Honda Esk Roush. Either way Love the raer spoiler, rear diffuser, and exhaust.